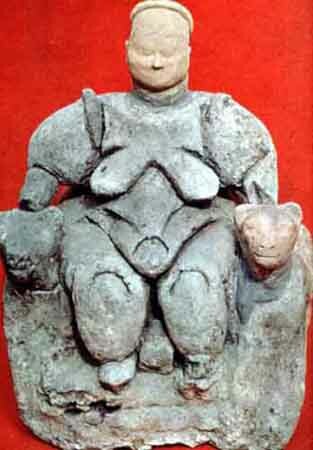 The mother goddess figure above was discovered in an area called Catalhoyuk, a very large Neolithic and Chalcolithic settlement in southern Anatolia, dating around 7500 BC. It is perhaps the largest and most sophisticated Neolithic site yet uncovered. Catalhoyuk is located overlooking wheatfields in the Konya Plain, southeast of the present-day city of Konya, Turkey, approximately 140 km from the twin-coned volcano of Hasan Dag. The eastern settlement forms a mound which would have risen about 20 metres above the plain at the time of the latest Neolithic occupation. There is also a smaller settlement mound to the west and a Byzantine settlement a few hundred meters to the east. The prehistoric mound settlements were abandoned before the Bronze Age. A channel of the ‚arsamba river once flowed between the two mounds, and the settlement was built on alluvial clay which may have been favourable for early agriculture. First discovered in 1958, the Catalhoyuk site was brought to worldwide attention by James Mellaart's excavations between 1961 and 1965, which revealed this section of Anatolia as a centre of advanced culture in the Neolithic period. The complex settlement was described by Mellaart as the earliest city in the world. However, it is more properly described as a large village rather than a true town, city or civilization. The community seems to have consisted entirely of domestic housing with open areas for dumping rubbish. There are no obvious public buildings or signs of division of labour, although some dwellings are larger than the rest and bear more elaborate wall paintings. The purpose of larger rooms remains unclear, though some sort of ritual purpose is suspected. The population of the eastern mound has been estimated at up to 10,000 people, but population totals likely varied over the communityÕs history. An average population of between 5,000 to 8,000 is a reasonable estimate. The inhabitants lived in mud-brick houses which were crammed together in an agglutinative manner. No footpaths or streets were used between the dwellings, which were clustered in a honeycomb-like maze. Most were accessed by holes in the ceiling, which were reached by interior and exterior ladders. Thus, their rooftops were their streets. The ceiling openings also served as the only source of ventilation, letting in fresh air and allowing smoke from open hearths and ovens to escape. Houses had plaster interiors characterized by squared off timber ladders or steep stairs, usually placed on the south wall of the room, as were cooking hearths and ovens. Each main room served as an area for cooking and daily activities. Raised platforms built along the walls of main rooms were used for sitting, working and sleeping. These platforms, and all interior walls, were carefully plastered to a smooth finish. Ancillary rooms were used as storage, and were accessed through low entry openings from main rooms. All rooms were kept scrupulously clean. Archaeologists identified very little trash or rubbish within the buildings, but found that trash heaps outside the ruins contain sewage and food waste as well as significant amounts of wood ash. In good weather, many daily activities may also have taken place on the rooftops, which conceivably formed an open air plaza. In later periods, large communal ovens appear to have been built on these rooftops. Over time, houses were renewed by partial demolition and rebuilding on a foundation of rubble - which was how the mound became built up. Up to eighteen levels of settlement have been uncovered. The people of Catalhoyuk buried their dead within the village. Human remains have been found in pits beneath the floors, and especially beneath hearths, the platforms within the main rooms and under the beds. The bodies were tightly flexed before burial, and were often placed in baskets or wrapped in reed mats. Disarticulated bones in some graves suggest that bodies may have been exposed in the open air for a time before the bones were gathered and buried. In some cases, graves were disturbed and the individualÕs head removed from the skeleton. These heads may have been used in ritual, as some were found in other areas of the community. Some skulls were plastered and painted with ochre to recreate human-like faces, a custom more characteristic of Neolithic sites in Syria and at Neolithic Jericho than at sites closer by. Vivid murals and figurines are found throughout the settlement, on interior and exterior walls. A wall map of the village is currently credited as the world's oldest map. Predominant images include men with erect phalluses, groups of men in hunting scenes, and red images of the now extinct aurochs and stags, and vultures swooping down on headless figures. Heads of animals were mounted on walls. 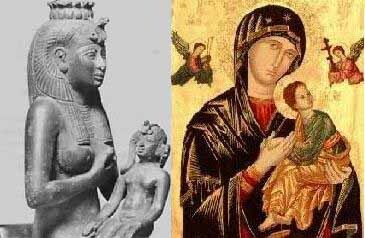 One, however - a stately seated Goddess flanked by two lions Ð was found in a grain bin, which Mellaart suggests might have been a means of ensuring the harvest or protecting the food supply - a mother goddess figurine. With this goddess we find similarities with other creational goddesses throughout history. She is the lion, the creator of the program.